Available Now: 2018 Edition. Call us directly for CFR Title availability. Due to the mandatory federal revision dates established per year, some Titles may not be available until a later date. Have a large order? Ask us about our discount pricing! Have a special request for spiral bound copies or perhaps a loose leaf? Or maybe you want to change the font of the text to a larger size? Contact us with any questions you have and we’d be happy to accommodate your needs! The same 8 CFR used by the Immigration and Naturalization Service, INS officers, paralegals, and attorneys. Containing a Codification of documents of general applicability and future effect. Also, see INA 2017. We stock all INS forms in packages of 100. I-693, I-765 cards, G-325A, N-400, and many others. Contact us about current release dates and discount pricing! A 5 Volume set for the Aeronautics and Space regulations, Also known as Federal Aviation Regulations. Contains all Customs Duties Regulations. Also used to prepare for customs Brokers Exam. Available in Recommended Spiral Bound for volume 1 parts 1-140 and volume 2 parts 141-199 optional volume 3 parts 200-END. Also available and necessary to take the Customs Brokers Exam is the Harmonized Tariff Schedule 2017 with subscription updates. 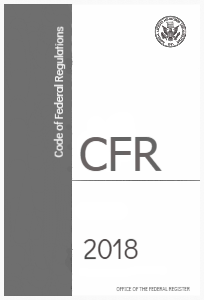 19 CFR Loose-leaf Version also referred to as Regulations of the U.S. Customs and Border Protection. Consists of 9 volumes in total. Title 21 CFR contains all Food and Drug Administration and the Department of Health and Human Services. SOLD AS A SET OR INDIVIDUAL VOLUMES. Also see Compilation of Laws Enforced by the US Food and Drug Administration, volume 1 & volume 2 sold separately. A one-volume set. We also stock the MPEP (Manual Of Patent Examining Procedure) and the TMMEP (Trademark Manual Of Examining Procedure) DISCOUNT ITEM. A 31 volume set or sold individually. Discounted item as a set, tiered discounts available on multiple sets. Contains 8 volumes sold as a set or individual volumes sold separately. Title 49 contains all Federal Transportation Regulations such as transportation of hazardous waste materials on Federal Highways, by sea, by air, pipelines, highway safety and more.